Not all dogs enjoy swimming — and not all dogs know how! My first dog loved the water and my second dog tolerated it. Henry, on the other hand, is not a fan. Even if your dog instinctively starts paddling in water, he might not stay afloat. Assume that your pup has no swimming abilities or inclinations. 2.) Don’t throw your dog into the water! Your dog might not naturally like water at first — but you can almost guarantee he never will if you traumatize him. Give him a chance to ease in and experience the water at his own pace. It’s easy to joke, “Oh, just throw him in! He’ll get used to it!” Let this stay a joke, please! Even the best swimmer can have issues, and it’s better to be safe than sorry — especially if you plan to be near a dock or on a boat. 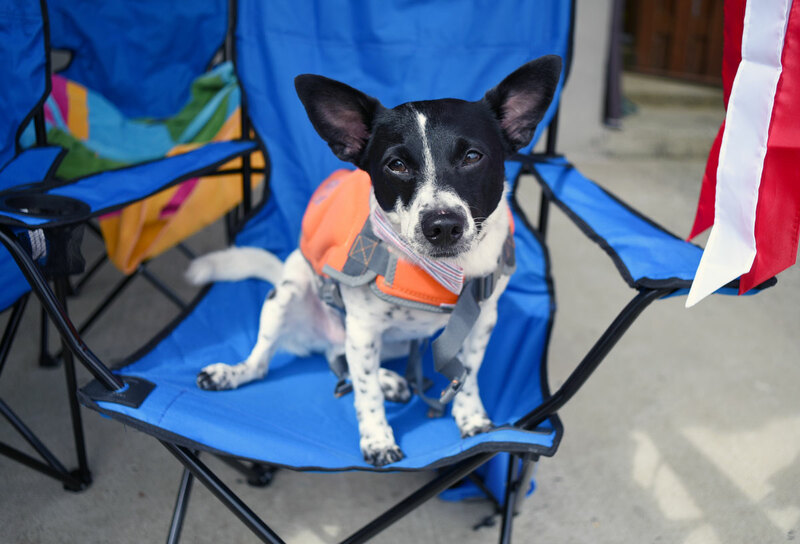 Buy a life jacket that fits well and will hold your pup’s weight. A handle is extra helpful! We bought one for trips on the boat, but because Henry has a tendency to lose his mind and bark at water fowl, I keep it on him on the dock as well. Even if your dog would rather swim than run, accidents can happen. If your dog is a poor swimmer, is alone too long, or doesn’t have an easy way to get out of the water, summer fun could turn to tragedy. 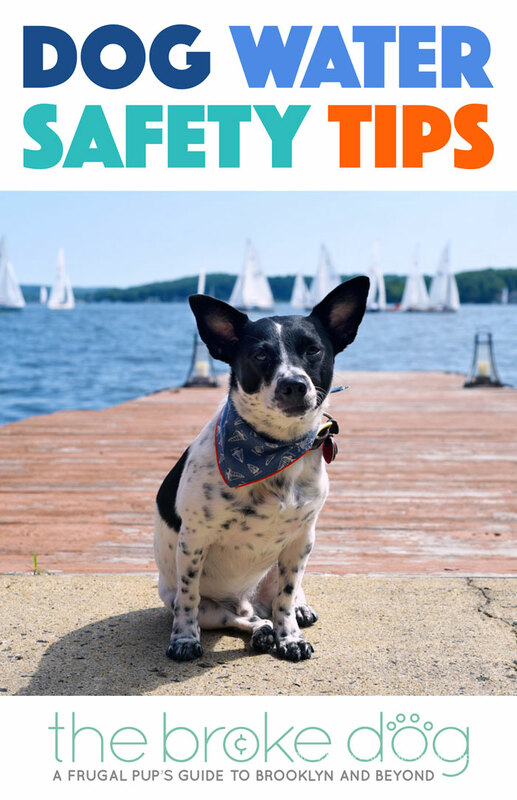 Keep an eye on your pup or fence off any water bodies or pools. You can’t enforce these dog water safety tips if you’re not there! If you show your dog an easy way to exit the pool 0r lake, he’ll be able to get out independently if he’s tired, in pain, or if he accidentally falls in. Don’t wait until an emergency to do this — he might be too stressed to think straight. My parents’ lake house doesn’t have an easy way for Henry to get out (there is a wall at the water’s edge), so I’m thinking about bringing a sturdy box that he can jump onto in a pinch. Keep a bowl of fresh water handy! Hydration is important, especially in the summer months. Having a bowl of fresh water available will not only encourage him to drink, it’ll keep him from drinking lake, pool, or ocean water. You don’t know what kind of bacteria, algae, or chemicals are lurking in the waves! 7.) Protect your pup’s paws! Concrete and wooden docks can get hot! Consider using a product to keep you pup’s paws from burning. Make sure there is a shady spot for your pup, too. 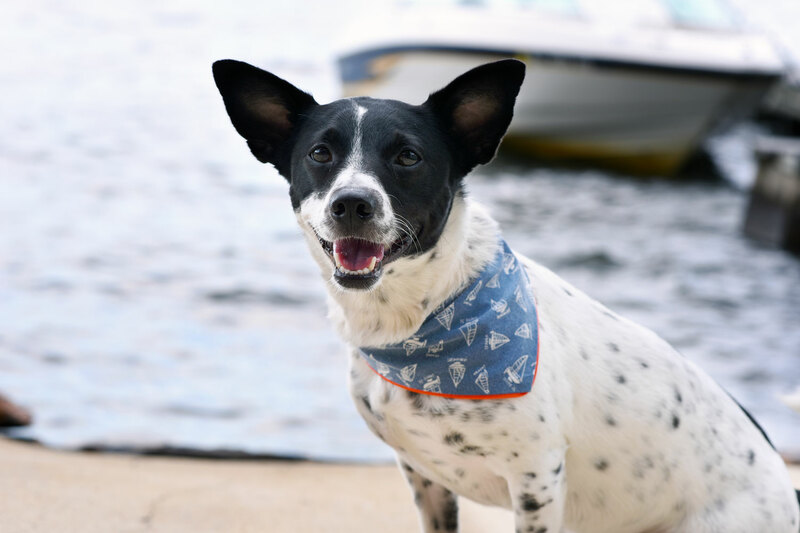 Be sure to thoroughly rinse your dog after a dip in the lake, pool, or ocean — this will wash off any skin irritants, algae, or chemicals that were in the water. Plus, fresh wet dog smell is better than dirty wet dog smell! You don’t want your pup to get an ear infection! Make sure their ears are clean and dry after each swim. Tending to Henry’s lakeside injury. It’s good to know basic first aid and dog CPR if you’re going to spend time on the water with your pup. Heck, it’s a good thing to know in general! I was glad I knew a few basic things when Henry cut the back of his paw during an afternoon by the water. Now I’m tracking down a good CPR and first aid class I can take so that I can be prepared for any issues. Wellness® CORE® RawRev™: Fuel For Summer Fun! This post has been sponsored by Wellness®, who provides quality nutrition for your pet in the summer and year round! 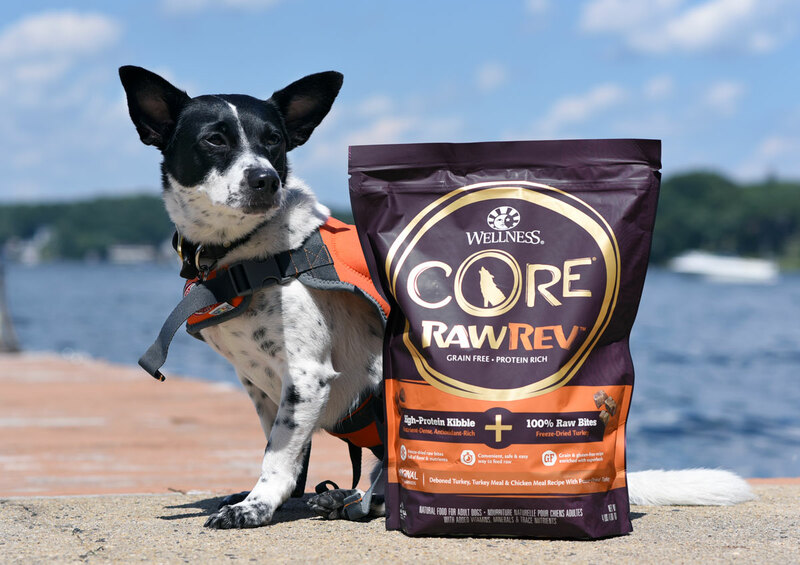 Wellness Core RawRev is specially formulated to make it both easy and safe to incorporate raw food into your dog’s diet. High-protein, grain-free kibble is combined with 100% raw meat pieces to create a savory, nutrient-rich meal packed with everything your dog needs to thrive from the core. 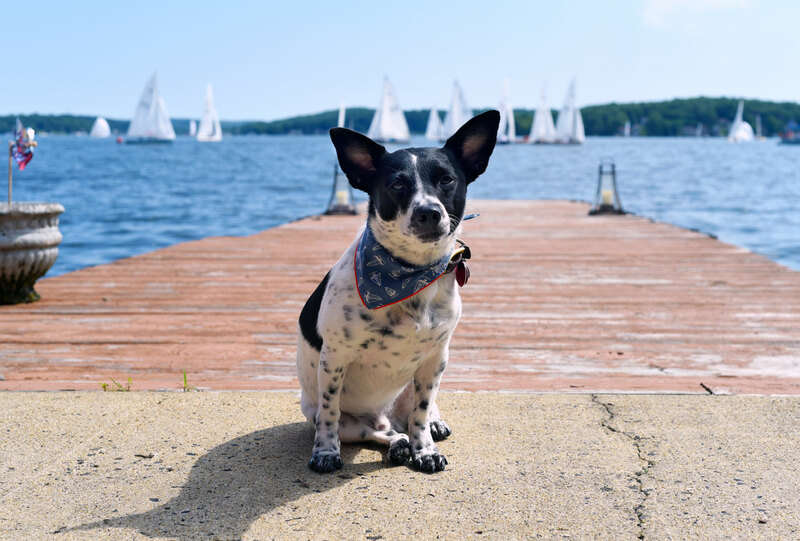 With our dog water safety tips and CORE RawRev’s whole-body health formula, your pup could be unstoppable this summer! To learn more, read our first Wellness Core RawRev post! Visit Wellness on Instagram, Twitter, Facebook, and Pinterest. Does your dog like to swim? Do you have any dog water safety tips to add? Tell us in the comments! I can see paw protection on your list, even though you are covering water safety. Good move. I remember at BlogPaws in Arizona, people were walking their dogs at 4 a.m. because it was the coolest time for an outdoor walk! Hydration and protection are critical and as for being stupid enough to throw your dog in the water. REALLY. Oh my goodness, I bet some people think its such fun but how scared can a dog get? 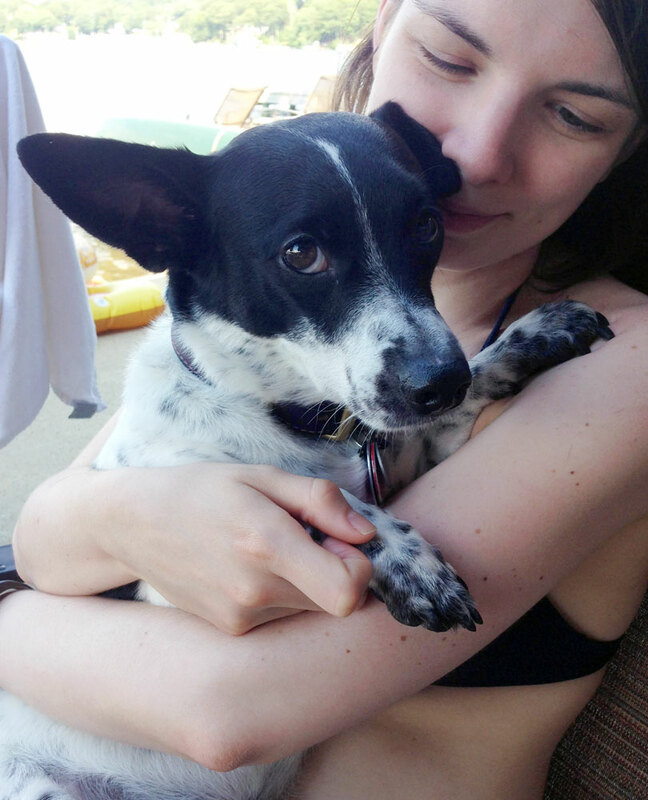 An amazing post addressing a supremely important topic for pet health sponsored by Wellness. I love their new product which allows for raw diet without the hassle. Your photos are beautifully crisp, and I really think Henry loves having all your attention! LOVE these tips! My absolute favorite (and one that I think is often overlooked) is the one about teaching your dog how to get OUT. Even if your dog is not a swimmer by choice, they should know that A. They CAN swim if they need to and B. How to get out of the water and back on dry land safely. Thanks for sharing! These are great tips. I don’t have a pup however, these make sense to me. I really like the tip about “don’t throw your dog in the water”. I’m sure there are many ignorant people out there that think dogs are like cats that almost always land on their feet. Thanks for sharing these tips for the season. My Babu hates the water, he will no even go near a gurgling stream. So we always keep an eye on him at the beach and when on hikes have his water bowl with his at all times. These are all such great safety tips, Rochelle! There’s a little dog at our beach area who insists on running up on the concrete wall and jumping into the water several feet down. The biggest issue is that he doesn’t understand that the tides is sometimes nice & high, but at certain times of the day it’s very low. It drives his mom nuts & really scares her when he does that! Henry looks so cute in his little life jacket, he must be so adorable playing around the lake! Perfect tips for water safety! We have a pool so I’ve taught all of my dogs how to swim and where the steps are. Our pool doesn’t have a fence so I keep a close eye on them around the pool just in case! I’m way too paranoid. I do like your tips of rinsing off and ear care. Those are two very important tips that are easy forgotten! And what a great summer fuel food for dogs?! My kids LOVE Wellness Core. We’ll be trying the RawRev soon, and I’m excited! We have the same life vest for one of our dogs! 🙂 Works like a charm. Always nice to have extra protection. Great tips! So much yes! For our little Chi who hadn’t gone swimming much we utilized a safety vest. She needed it because the big dogs were making big waves! A lot of folks don’t think about the paw protection, either. I bought everyone a pair of boots after we went to the beach one time and the walk to the shoreline was sand. It was so hot, the dogs refused to walk on it. Good thing I brought booties. People just don’t realize, especially if they have shoes on themselves. Great tips! My mom’s dog didn’t like the water.although it could be because we trained him to stay away from the pool as a puppy. Great tips. Water can be so much fun, but also very scary for some. I love having Dexter use his life jacket when we are boating, it’s such a relief knowing he will be safe if something happens. Also, watch out for signs of water intoxication when your dog is swimming and playing in the water. 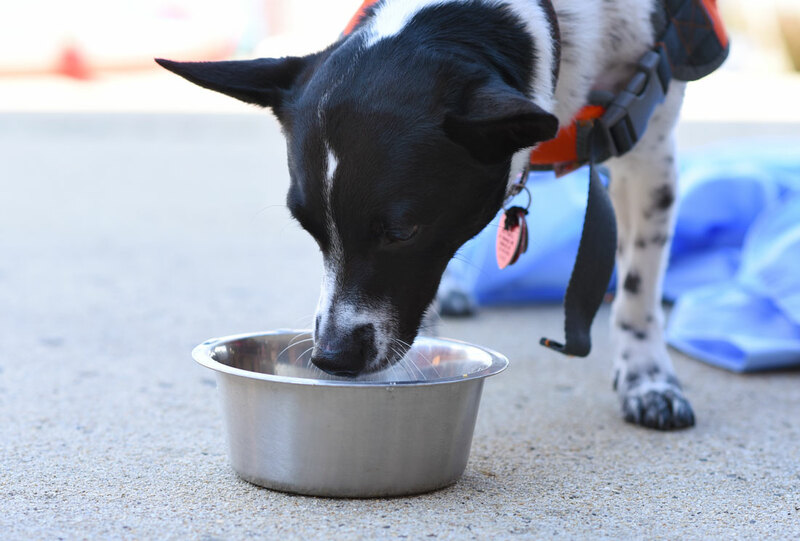 Water intoxication or hyponatremia in dogs can be life threatening. Great safety tips. I’ve had several dogs that love water, some that tolerate it, and one that hates it. I’ve found their first introduction is critical and is best done when they are still young and can follow you into the water. They feel a lot safer with mom or dad around. A tennis ball also helps. But don’t drag your dog in with a leash – then they’ll hate it. Buffy actually walked underwater when I dragged her into Lake Michigan. I never thought that was possible! These are wonderful tips, all too often, tragedy is preventable. We live right next to part of the old Erie Canal. I see a lot of dogs on boats, but most of them don’t have a life vest. My dogs don’t like the water very much. Theo likes to be in a floatie in the pool, but he is never left alone. These are some great tips and a cute dog! Love the life jacket and never thought of something for their paws for the heat! Really important information. All too often I see dogs without life jackets in a dingy on Lake MI, which really upsets me. Even if the dog CAN swim the waves can be treacherous. Thank you for writing this. I always take my two pups to the river in the summer days. These are great tips for anyone who plans on visiting the river this summer. 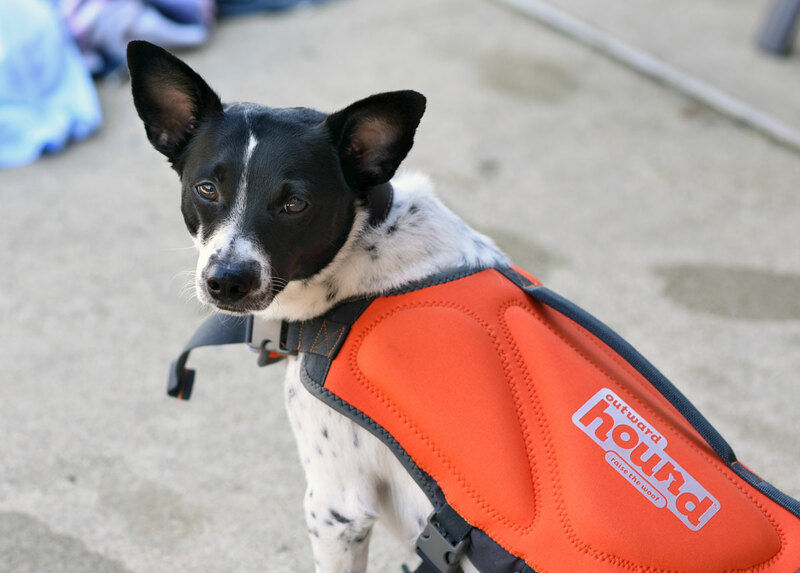 Lifejackets are very important when swimming with dogs, that’s for sure! So many valuable tips! I can’t imagine just throwing a dog into the water without proper training for the pup. I agree with all you said – what sticks out to me the most is keeping the pup’s paws protected, plenty of fresh water, and a life jacket! Important tips for us here as Kilo the Pug might sink like a stone. He has such a big heavy head and chest and bad breathing at the best of times. He has a life jacket for lake visits and I tried him swimming in a pool last week for the first time. I held him and let him dog paddle in my hands and touch the big step fast and then gave him treats. I wouldn’t say he loved it but it cooled him off, gave him exercise and he certainly didn’t hate it. I washed him off after because of chlorine and I kept his ears and face dry and clean. I can attest to the fact that not all dogs like water — I hate it, it’s scary and wet. I even prefer to have a shower when I need to get clean rather than a bath. I’m not big on losing control, and that’s what swimming feels like. Thanks for sharing with the human world! I’ve seen so many people forcing their dogs to learn how to swim. It always made me sad. Though I do believe that every dog can swim when they have to. Such as Bruin when he slid down a slick flat rock and fell into water, he swam just fine until we got him out. My old man LOVED to swim! Vino and Karma however can’t be bothered lol. They go in as long as they can touch the ground. Otherwise it’s not happening Great tips!